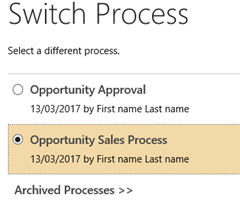 The new business process flow designer in Dynamics 365 is lovely! However, I'm not going to talk about that since it's rightly had lots of love by others already. 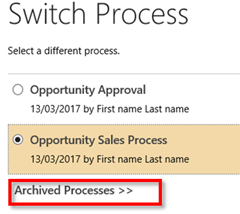 For me the biggest change in Dynamics 365 is the fact that running Business Process Flows (BPFs) are now stored as entity records. Instance details are no longer held as fields on the associated record. I first visited this topic back in the CRM2013 days with the introductions of Business Process Flows where I described how to programmatically change the process. Traversed Path: A comma separated string listing the GUIDs of current path of steps taken through the BPF. This is to support BPFs with branching logic. Active Stage Id: The ID of the BPF step that is active – replaces the Stage Id attribute. 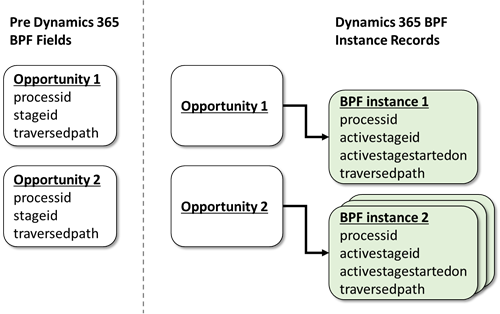 State & Status: Each BPF Instance has its own state that allows finishing and abandoning before other BPF are run. Switching BPFs no longer overwrites the previous active step – meaning that you can 'switch' back to a previously started BPF and it will carry on from the same place. This means that BPFs can run in parallel on the same record. If a user does not have access to the running BPF they will see the next running BPF in the list (that they have access to). If the user has no access to any BPF that is active – then no BPF is shown at all. If user has read only access to the BPF that is running, then they can see it, but not change the active step. When a new record is created, the first BPF that the user has create privileges on is automatically started. When you use the Switch Process dialog, you can now see if the Business Process Flow is already running, who started it and when it was run. NOTE: Because the roles reference the BPF entities – you must also include the system generated BPF entities in any solution you intend to export and import into another system. Now that we have the ability to store addition data on the running BPF instance, we have the time that the current step was started on. This also means that when switching between processes, we can see the time spent in each step in parallel running BPFs. Since each BPF has its own state fields, a business process can be marked as Finished – or Abandoned at which point it becomes greyed out and read only. When you 'Abandon' or 'Finish' a BPF it is moved into the 'Archived' section of the 'Switch Process' dialog. NOTE: You might think that this means that you could then run the BPF a second time, but in-fact it can only have a single instance per BPF – and you must 'Reactivate' it to use it again. Reactivating a Finished BPF will start it from the beginning again. Imagine your business has a sales process that requires an approval by a Sales Manager. At a specific step in that sales process you could run a workflow to start a parallel BPF that only the Sales Managers have access to. When they view the record, making the Approval BPF higher in the ordered list of BPFS will mean that they will see the Approval BPF instead of the main Sales Process. They can then advance the steps to 'Approved' and mark as Finished. This could then in turn start another Workflow that updates a field on the Opportunity. Using this technique in combination with Field Level Security gives a rather neat solution for custom approval processes. When I first saw this change I admit I was rather nervous because it was such a big system change. I've now done a number of upgrades to Dynamics 365 and the issues I found have all been resolved. I'm really starting to like the new possibilities that Parallel BPFs brings to Dynamics 365.